Get off the beaten path with this tour of Baltimore’s vibrant Mount Vernon neighborhood. You’ll learn about Baltimore’s place in early American history, check out filming locations for several popular television shows, marvel at the beauty of America’s first Roman Catholic Church, and grab a snack from a vendor at one of the city’s most bustling markets. By the end of this tour, we’ll have you feeling like a proper Baltimore local! 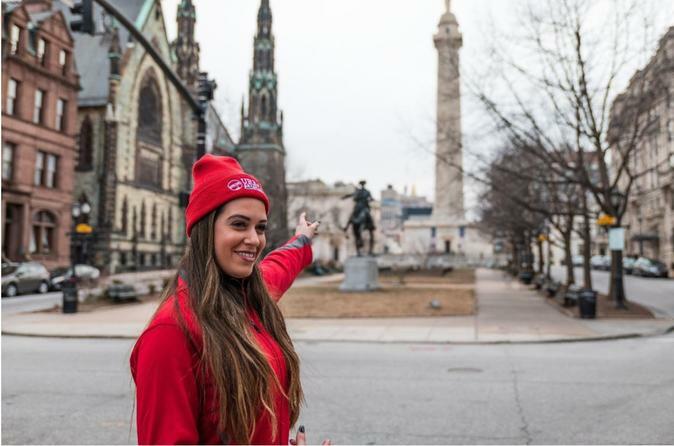 Our tour of the Mount Vernon neighborhood of Baltimore begins at the city’s Washington Monument: the first monument erected to honor George Washington and it just so happens to be the predecessor to the famous monument that stands on the National Mall in Washington DC. Here we will talk about the history of the neighborhood, its diverse and changing architecture and the modern-day interests that stem from the area. From here, we will make our way down Charles Street, one of the main thoroughfares in Baltimore, towards the birthplace of an enduring and familiar staple of the paranormal world (and many a school sleepover!). Along the way, your guide will point out several buildings of interest — such as filming locations for some of TV’s most popular shows. Fun fact: lots of shows that are supposed to be set in Washington DC are actually filmed in Baltimore because of the similarities in their neighborhoods’ architecture. Soon we will arrive at the Baltimore Basilica, or to use its full name: Basilica of the National Shrine of the Assumption of the Blessed Virgin Mary. This stately neoclassical building was the very first Roman Catholic Church built in the United States. Conditions permitting, your guide will take you inside the columned entrance to marvel at the domed ceilings, marble and granite construction, prayer chapels and works of art. Our next destination is inside the Mount Vernon Marketplace, part of the regrowth of the neighborhood. Inside this former-warehouse is one of the city’s most popular new stops for artisanal food and drinks of all kinds. Your guide will show you to his or her favorite spot and order up a bite for the group to enjoy. Need one final history and architecture fix? We’ll head back out to see a few more sights before making our way to our final stop for a coffee or tea at a nearby coffeehouse with an international flare. Your guide will happily suggest their favorite cookie to go along with your beverage of choice.